My mom kept several gardens on our 7-acre hobby farm when I was a kid. 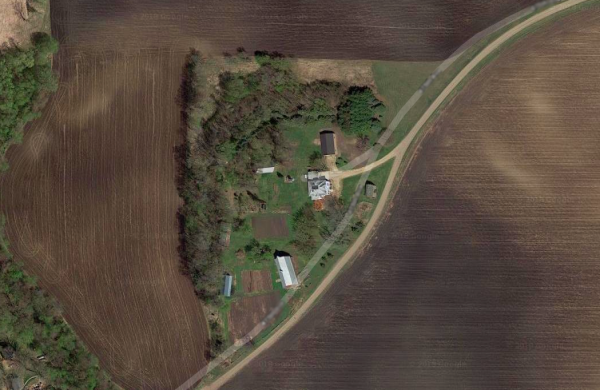 Our acreage was shaped like a triangle and my mom was always finding new ways to put almost every square foot to good use. Mom had several flower beds and gardens and around the property too. All different varieties sprang up at every turn- lilies, phlox, snapdragons, tulips, lilacs…if it could be grown in Minnesota, I’m sure we had it there on the farm. My mom was always pulling food out of the ground and making it into something magical too. Of course, I don’t remember thinking that at the time, what with all the weeding involved, but looking back, I sure do feel lucky to have a mom who experienced so much joy working with the Earth and that was so effortlessly creative. We were at her house (in Florida) a few weeks ago and she decided to whip up some pesto with the basil in her backyard. 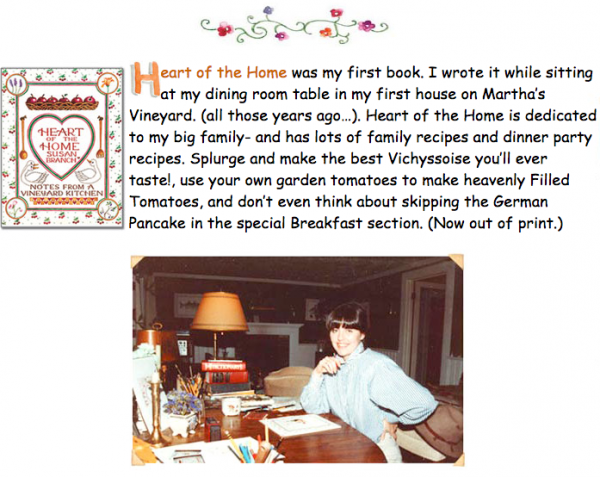 The recipe came from a cookbook called Heart of the Home (by Susan Branch) and my mom said she bought her copy in 1986. Preheat the oven to 450 degrees. Butter a heavy 10″ oven-proof skillet. In a bowl, beat the eggs with a fork to blend. Slowly add the flour, beating constantly. Stir in the salt and milk. Pour the batter into the skillet and drop the butter by teaspoonfuls into the batter, distributing evenly. Bake at 450 degrees for 15 minutes. Reduce heat to 350 degrees and bake for another 10 minutes. Remove from oven and sift with powdered sugar (and strawberries or fresh fruit of choice). Serve with heated maple syrup. Wow! Is your mouth watering too? And like my mom mentioned in the video, I’d suggest not putting the olive oil in the processor. She says it makes the pesto taste bitter and apparently lots of folks on the internet agreed. Just stir it in by hand in a separate bowl with all the other ingredients. It’s SO delicious! Thank you for sharing this lovely family video. You look so much like your beautiful mother. 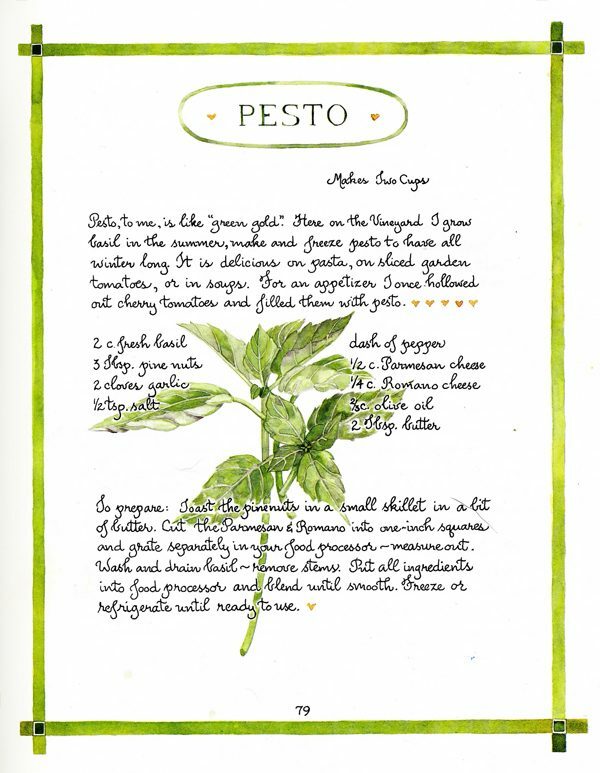 I love pesto and look forward to trying this recipe! I so enjoy your postings and follow you regularly!!! Every year. I’ve saved them all. I love having it hang in my kitchen. They are like my journals. Her artwork is precious. German pancakes are so good! You must try them! They are so good sprinkled with strawberries and brown sugar! 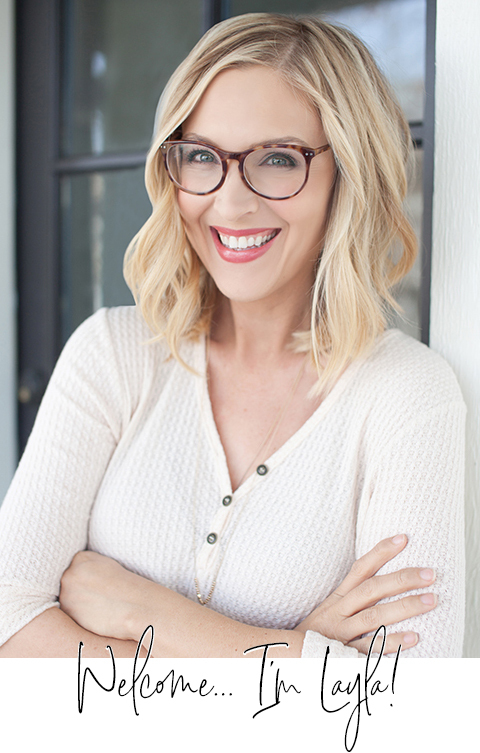 I adore Susan Branch! I have her recipe binder and I love it so much. Now I’m going to be on the hunt for this book. Also if you’ve never tried”ditch babies or German pancakes” they are amazing!!! 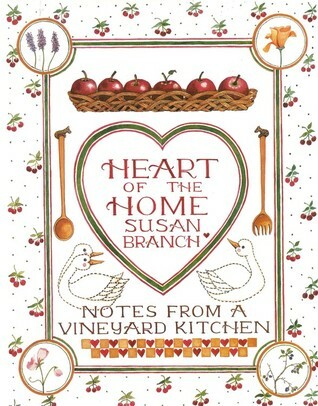 I adore Susan Branch! I have her recipe binder and I love it! 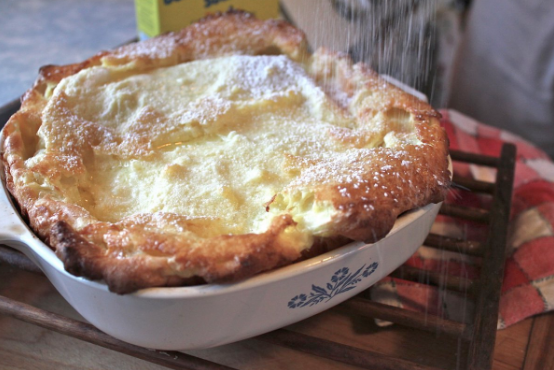 If you haven’t tried Dutch babies also known as German pancakes they are amazing!!! We love them with fresh squeeze lemon and powdered sugar! What a charming video. You look like your mom 😉 , she seems like a strong and healthy and amazing woman, I enjoyed seeing your son and she interacting. We used to sell Susan Branch in our Christian book store way back when..everything looks good. Susan Branch’s books, ‘The Fairy Tale Girl’, ‘Martha’s Vineyard, Isle of Dreams’, and ‘A Fine Romance, Falling in Love with the English Countryside’ are such wonderful, interesting memoir. There is serious talk of making her life story into a movie! She is a beautiful soul! Pesto is life! Can’t get enough of it in the summer, fresh basil out of the garden….heavenly! Such a sweet video! Your Momma is beautiful! Thank you!